I say save yourself a shitload of headache and just use native Windows tools............not exactly the best or quickest solution, but you can download VirtualBox or VMware Workstation, then download a trial copy of Windows (any version, doesn't matter), then boot the Windows ISO in the VM. Before doing that, download GetWAIKTools, run it with WINE, let it fetch the appropriate WAIK files as per your desired Windows version. Copy those files off to a partition somewhere (preferably NTFS, FAT32, or exFAT, since that's primarily what the Windows installer is limited to accessing), ImageX.exe (or DISM.exe, never tried it) and bcdboot.exe are what you'll need. Back to booting the ISO, instead of installing Windows the "normal" way (via the GUI setup), hit Shift+F10, 'diskpart', assign drive letter(s) to your desired boot and Windows partitions, and another for the location of the WAIK files. 1 represents the edition of Windows you want to install (Home Premium, Pro, Enterprise, etc), change it as necessary (imagex /info <location of WIM here>. C represents your destination Windows volume. A represents either your EFI system partition (for UEFI booting) *OR* your System Reserved partition (for BIOS booting). You can get a complete list of bcdboot command parameters via Google. Edited by AnonVendetta, 02 May 2015 - 03:53 PM. Performing this task under a winpe is indeed a piece of cake as indeed it takes little effort and time to generate a winpe and prepare a system. The challenge here is to do without windows tools while increasing knowledge around the BCD store. That's completely understandable. I was just offering another method (one that the OP was probably aware of, but whatever). I dont mind finding unusual ways to solve a problem, besides the traditional methods. But sometimes I just dont feel like banging my head all day against a problem, when there are easier and quicker ways to do it. I already create enough problems in my life on a day to day basis, both intentional and unintentional, and sometimes I get aggravated at having to spend alot of time coming up with solutions. To put things in perspective, you can chop down a tree with a chainsaw, or you can try to to drive thru it with a 18-wheeler. They both work, but most logical people will choose the former. Edited by AnonVendetta, 02 May 2015 - 04:10 PM. Currently we do this in WinPE, but would like to do it in Linux because linux PXE boots a lot faster. Do not use Linux, use a WinPE instead, here is how to do it in a much more complex way, that has nothing to do with PXE booting and senselessly involves a trial .iso and a VM, hope this helps. There is a new BCD element setting for Win7 that makes the MS boot manager (bootmgr) go hunting across partitions for a bootable Windows operating system. The Windows sysprep tool will set the necessary BCD Elements of device and osdevice to "Locate" and this allows for the copying of hard drives or the cloning of Win7 in tandem with a System Reserved partition. The tag file names are defined at entry 12000002 and 22000002. Other unique names should be possible. But apart Sysprep is there a way to set the BCD like that (like through WMI as hinted on the given page)? or one has to import manually to the BCD (mounted as Registry hive or using - say - erwan.l's Offline Registry thingy) the giiven hex ? In any case it seems that the 0x08 @ offset 0x10 means "locate" and the "element number" is @ 0x24, and we have to understand the 0x1E @ 0x18, maybe it means "custom". So the only difficult part may be dealing with the BCD store --- which *can* be edited from Linux if required since it is the same file format as the Windows registry. But you'd need to know exactly which changes (if any) need to be made. At the winbuilder side we can help with that part. We wrote libraries for natively read/write/edit registry hives regardless of the operating system underneath (Linux, Windows) and this permits changing the BCD as needed. It can import registry files directly into an offline hive through the command line if needed. Downside is requiring Java to be available on the Linux distro. It should be possible to compile winbuilder to run as a native Linux application and avoid installing Java, we just don't have much demand/resources to follow that route. If you prefer, there is NO issue whatever in writing a given set of hex value as a hex key called "\objects\guid2\11000001\Element", the issue is more into knowing that "\objects\guid2\21000001\Element" corresponds to "OSDevice" and WHAT exactly needs to be written there that will be later interpreted as "boot", "partition=x:" or "locate=custom:22000002". If you prefer there are two levels of translation, one between the stupid hive format and "plain text" and one between the "plain text" and the BCDEDIT (or BCD WMI provider) lingo. There is a good chance: the system was syspreped before. Do you like to apply a default install.wim or a custom made wim file? to set the BCD like that (like through WMI as hinted on the given page)? or one has to import manually to the BCD (mounted as Registry hive or using - say - erwan.l's Offline Registry thingy) the giiven hex ? I've no luck with regedit import, but reg.exe works. The GUID is a example, has to be adjusted at local bcd file. Not tested at a multi boot environment so far. for the record, in bootice, BOOT and LOCATE seems to be treated the same whereas reading above they seem to have different behaviors. 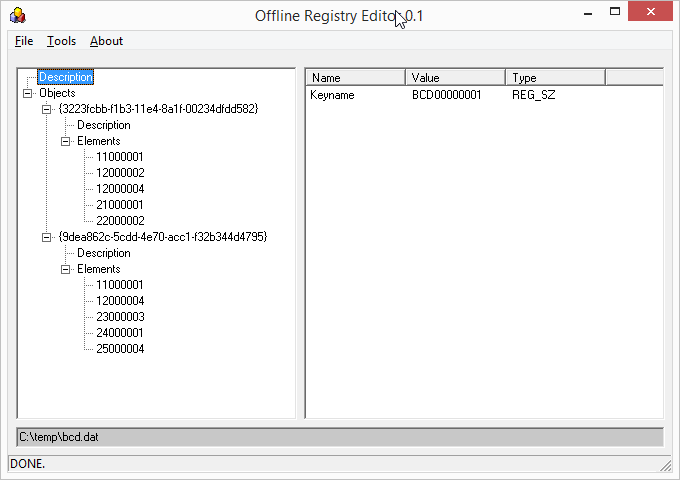 Also, Offline Registry Editor, based on the MS library can edit a BCD store but the GUI is early alpha thus... (i.e to be improved). The BCD store does not stay open (see below). It is unlikely to work on systems with UEFI firmware. I've only tested it on a 32-bit Windows 7 (SP1) system. Whether it will be suitable for your requirements remains to be seen. I have no idea whether the .wim you intend to apply is a sysprepped image, or a partially completed installation, or something else. The attached BCD store was able to boot Windows 7 - it replaced the hardcoded BCD store that had been created when Windows 7 was installed. I tried it on two different (virtual) systems with different disk signatures and partition offsets just to be sure. I attempted to use this same store to complete a Windows installation (after the files had been copied from the DVD during the initial phase of setup - following the first reboot) - it failed. Using a sysprepped BCD store taken from another system, which also had the relevant paths set as Locate, setup completed without error. I've therefore also attached a sysprepped Windows 7 BCD store. Please experiment with both BCD stores and report back. Cannot edit Element: Error writing the value's new contents. Cannot import: *.reg: Not all data was successfully written to the registry. Some keys are open by the system or other processes. The above settings were obtained by creating a basic BCD store using boot as path (see post #9). The BCD store was mounted in regedit and the settings were exported as a .reg file. Elements 21000001 and 11000001 were then edited - settings were copied from a BCD store prepared with sysprep (using the /generalize switch). The Windows Boot Manager bootmgr is located at the boot partition. Dosn't match device "boot" better? If you are having issues with regedit, you can also use offlinereg and therefore avoid having to import/export in regedit. You can then create a native hive from scratch and edit it offline. The command line syntaxt is not the most friendly one (...) but I am opened to suggestions. Try getting ownership (or change permissions) of the BCD hive or key. The whole BCD stuff belongs to MS , not to you and you are given very limited permissions on the objects within it. I agree. It makes absolutely no sense for the path to bootmgr to be set as locate as it is always going to be on the boot device. This is however how it was set when running sysprep - more MS weirdness. I haven't tried using a combination of boot (for the bath to bootmgr) and locate (for paths to the OS) yet. Based on post #34 I'm assuming you already have? Offlinereg looks like yet another interesting and useful app. I keep seeing references to it throughout the forum but have yet to use it - it is now on my list of things to do! I did have a very quick play with Offlinereg_GUI.exe and it was possible to change the elements values without any issues. I tried - made no difference. And I did own it - I was attempting to edit a BCD store I had created from scratch! Did a very quick test with the command line version of Offlinereg - very nice app. Thanks for taking the time out to post some instructions (see post #38). Well I can edit entries fine here on my XP SP2, once I have set the "element" to "full control" for the Admin (and being an Admin). Try manually editing in Regedit the attached (which is "your" BCD with the "locate" settings) set with full control to "everyone". Good to have a rational reason, besides my gut feelings. It would be interesting to understand why exactly this happens, however , it is really strange as while I may understand how a BCD loaded "normally" as BCD000000 might have some added (artificial) editing limitations in Vista and later, the same hive loaded as (say) HKLM\myniceBCD shouldn't be "limited", unless *somehow* the good MS guys "blacklisted" key names like "11000001"
I generated a full bcd with the code below based on the reg file posted my Misty. bcdedit /store c:\temp\bcd.dat tells me there is no store in this file (???). bcdedit /store c:\temp\bcd.dat /enum all /v give the following . could it be that some entries are missing in Misty reg file or is generating a bcd from a blank hive not possible? Are you sure about the below? Over here this key (24000001) is usually similar to 23000003 and contains a GUID. Checking here, 24000001 = DisplayOrder . I have edited my script above. Now, my bcd is read correctly by bcdedit. The trick was to push the display order field as a multi string. I am tempted to give a go at this libregf (another lib from libyal). My understanding is that one could build it both under windows and linux. It could (may be?) 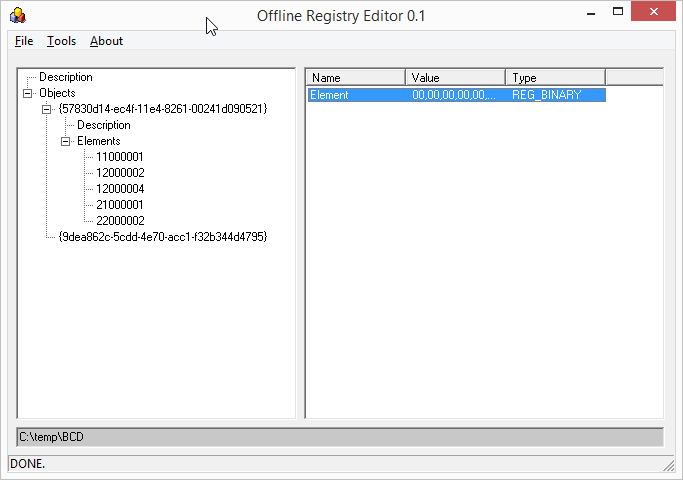 replace the offline registry library from MS. I generated a full bcd with the code below based on the reg file posted my Misty.....could it be that some entries are missing in Misty reg file or is generating a bcd from a blank hive not possible? I tried again - importing the same .reg file from my previous post (#36), then in regedit > right-click > export > Save as type: Registry Hive Files (*. *) - it worked (again) when used to boot a system on a virtual PC. Interestingly it was 8 kb in size - after running bcdedit /enum all /v on it, it increased to 12 kb in size! It was an issue with my script. I can now generate a bcd from scratch using a blank hive. Looks like we can build a BCD store without the need for bcdedit and thus giving more options/flexibility.